Perfect for Amazon, Ebay & eStores. If you want to compete selling products on Amazon, Ebay or in an Online Store then you need REAL Wholesalers located at the TOP of the Supply Chain. 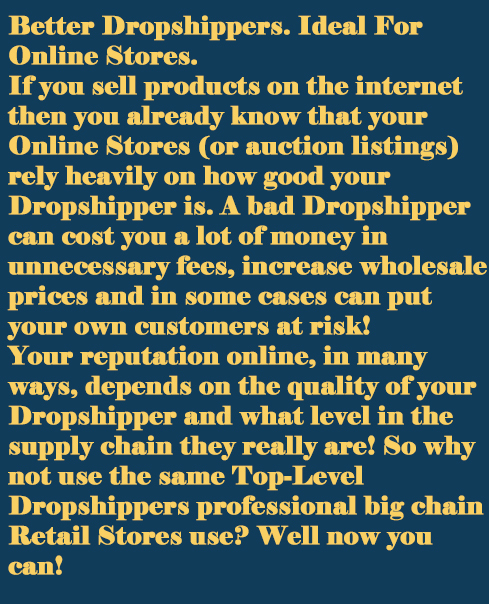 Using Dropship Pages Company Directory of Certified Wholesalers you'll quickly discover who the REAL Dropshippers are for the products you want to sell online! Work directly with 100% Certified Suppliers. 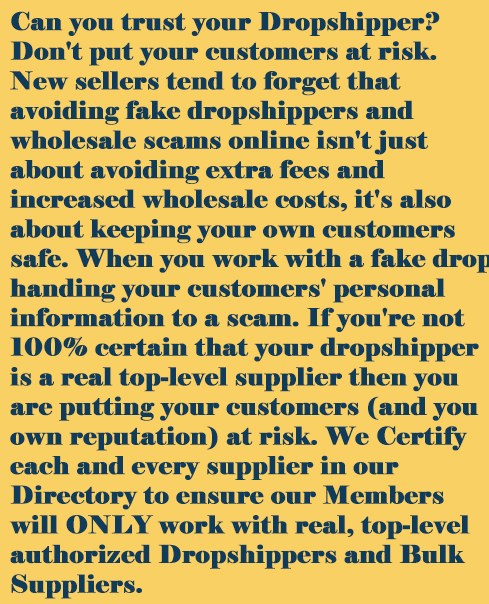 At Dropship Pages Company we work hard to ensure that EVERY Wholesaler listed in our Directory is a 100% genuine Top-Level Wholesale Supplier. Only the best Suppliers qualify for our Certified Seal. You can enjoy working directly with safe, secure, reliable CERTIFIED Dropshippers and Bulk Suppliers. Keep your customers safe and your reputation great! Better Wholesale Product Directory. Our Mission at Dropship Pages Company has always been to give online sellers direct access to the best Wholesalers you can find. We believe you deserve the same wholesale opportunities and product selections as brick and mortar stores. 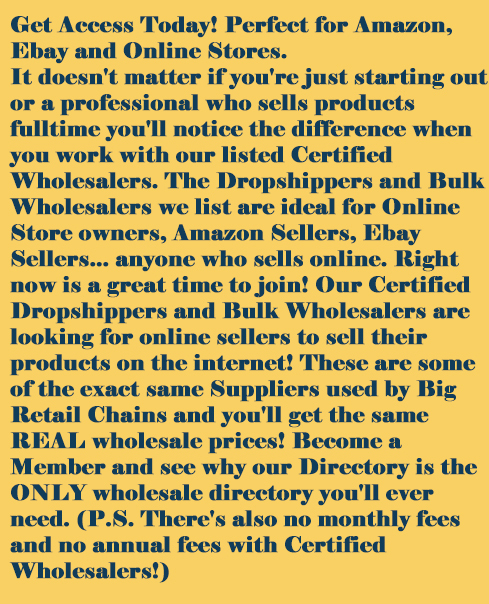 Only Top-Level (top of the Supply Chain) Dropshippers and Bulk Wholesalers make it into our Directory of Certified Wholesalers. Our Members enjoy the many benefits of working with Certified Wholesalers (some are even the exact same Supplies used by Big Retail Stores!) Get Instant Access to our Directory Today and see for yourself why Certified Wholesalers are BETTER! 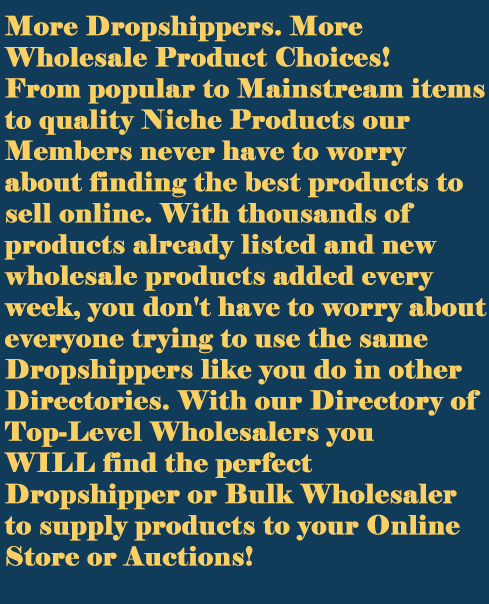 The latest wholesale news, tips and Dropship Pages Company info delivered right to your inbox!